"At least it's not a swim start...." Despite the 28 degree temperature to start the race, the rest of the day in the Central Sierra was amazing. Soft ground from recent rains, no wind, and just enough chill in the air to keep us moving quickly. Charles Triponez and Roy Malone teamed up to compete in the Gold Rush (aka Cold Rush) 8-hour adventure race in Pinecrest, CA. 6 Hours and 20 minutes after starting, Team Bones Adventure Racing was the first to cross the finish line after 14 miles of trail running, 18 miles on the MTB, 6 miles of lake paddling, and a 300' rappel. Fantastic course designed by Gold Rush Adventure Racing. Despite the 8 am start, the morning of the first day was certainly not leisurely. Expedition length adventure races, like the only Adventure Racing World Series event held in the US this year the Gold Rush Mother Lode, really start days ahead of time. Just getting all the gear, food, and teammates to the starting line is essentially a pre-stage of the race. For the Gold Rush Mother Lode (GRML), we (Team Bones) had made it through the skills and gear check and to the pre-race briefing without a hitch. We only got info for the first 2 stages of the race and figured we'd have a pretty easy night planning our early race strategy. Things went pretty smoothly and we hit the sack for that inevitably fitful night of pre-race sleep. We set the alarms to give us just enough time to get to the busses that would be taking us to the start line. After a quick jump of Roy's dead car battery (foul play? Nah, pretty standard AR murphy's law), we squeaked into the bus just before the 6 am departure. Stage -1, compete. Anyone who's done some adventure racing knows that it doesn't matter if the race is only 3 hours or 8 days long, the start is a sprint. The GRML 2013, expected to take 72-80 hours, was no exception with a 4-mile trail sprint start to break up teams for the ensuing paddle. We blazed the run and lugged our boats to the very low (essentially a drought year) New Melones Reservoir (Elev. 960ft… 130 below "normal"). The paddling was hot and sunny. About 2 hours in, we beached the boat for a 15-mile trek and 2 checkpoints. We arrived at the boat drop in 2nd place, having been just barely passed by Team Sweco. The lead change with Sweco was a theme that played out 11 times during the race. Despite the race directors assurances that bushwhacking was not necessary on this trek, it was… for us and Sweco anyway. Realizing the ridiculous amount of poison oak we went left and took a slightly longer (but all on trail) route to the next CP, only to get there about 5 minutes after Sweco and the new 2nd place team (who had both bushwhacked). Our route selection to the next CP was lacking. The map showed only 1 trail, but there were 2 on the ground. Taking what we thought was the one that more closely followed the one on the map, we shortly caught up with the 2 teams ahead of us but arrived at the next CP in 8th place, but only 10-15 minutes from the lead. With a little more bushwhacking and pushing the pace on the way back to the boats, we started the next paddle leg in 4th. But the price for that little bushwhack is only now being paid as the poison oak has me squirming. The rest of the paddle was pretty uneventful. Long and grueling with small portage to save a few minutes. We arrived at the end of the lake with a 2-mile trek at nearly the same time as the 3rd place team. When they took perplexing and sketchy looking route straight up the canyon to a road that descended to the TA, we jumped into 3rd place and arrived at the TA about 10 minutes ahead of them. A quick transition and we headed out on the bike leg in 3rd about 30 minutes behind 1st and 25 minutes behind second. Despite some pace altering cramping, we caught and passed the Yogaslackers and Sweco by about 25 miles (or 2/3 of the ride). We passed Sweco as they were coming back towards us not liking the route they'd chosen. But when we stayed the course confident we could get through, they quickly changed their mind and chased after us. At CP 9 we parted ways with Sweco again as they took a different route to TA2 arriving about 20 minutes behind us. Less than 24 hours into the race we prepped our packs for what was to be a LOOOONG trek. I guess you could call it a trek, rope section, and another trek, but since we had to carry all of our gear and food for the whole stage from the beginning, we had to think about the 80-mile section as one big beast. With 40 hours of food and our climbing and mandatory gear, our packs weighed a TON and we expected some pretty brutalized feet. From a foot perspective, the trek was very dry and this was good, but from a hydration point of view, this was pretty tough. After some back and forth on the first 7 hours of the trek, we pulled away from Sweco on our way up to Pike's Peak and CP 12, an exposed flat chunk of rock with amazing views. Getting pretty desperate for water, we stumbled across an unoccupied cabin with a hose. And since we hadn't seen water in any of the creeks in the previous 10 hours, we took full advantage filling our packs. Rehydrated we charged ahead to CP 13 only to find Sweco already there resting in the shade. We have no idea how they passed us as our route since we'd last seen them was super clean, though a little dehydration slowed at times. Regardless, next few hours was a familiar back and forth to CP 14 after which we took our first 30-minute sleep of the race and let Sweco go. By sleeping in the late afternoon of day 2, we ensured a good sleep and not the shiver-fest often enjoyed by the 2 am standard AR sleep. We awoke refreshed and caught Sweco again about 2 hours later just as they were going down to sleep. Our pace after the nap was much improved and we powered away from Sweco… for the time being. The rope section at GRML was pretty impressive, even in the dark. A 250-foot free ascent followed by a short rappel, a 700-foot tyrolean/zipline, and a 300-foot rappel were pretty rad by any AR standards. There was some slight confusion as the order of the ropes changed sometime after the start and so we were given some vaguely confusing instruction as we approached the ropes area that led to us doing a 2 hour bushwhack circumnavigation of the entire rope site looking for the ascent start. A bit frustrated we finally found it and heard that Sweco had arrived about an hour before us and were now in the lead. But they had their own issue as they had been misinformed about leaving their packs at the start of the ascent. So when they finished the ropes course they had to backtrack to pick up their packs, putting us back in the lead for a while. Race organization was pretty accommodating and said they would make the appropriate time adjustments as needed once they'd had some time to consider everything. In the meantime, we headed out for the second half of the trek (with much more off trail/road travel) with Sweco hot on our heels. Shortly after leaving the ropes, the need for sleep caught up with us again and we dropped for a more standard hour of space blanket AR shiver-sleep. While we pseudo-slept, Sweco caught us and found the same confusing intersection that had partly prompted our sleep. The looped around us several times before disappearing into the night. After we awoke, the trails made a lot more sense and we blazed off to CP 17 and another meeting of Sweco, but we made brief hiccup in route selection that let them get just out of sight as we cruised to CP 18. At this point, it was nearing 48 hours into the race, and we were into Saturday morning which happened to be the opening day of deer hunting season. I can imagine that many hunters were disappointed to find random groups of stinky loud stumbling groups disrupting their secret dear hunting grounds. We passed countless hunters and hunting camps for the rest of the race. After getting CP 18, we ascended Cooper Peak. At almost 10,000 feet, the highest point in the race and the point when we realized the weather was changing. A pretty decent storm was coming in and the teams behind us would feel the brunt of rain, snow, and hail at high elevation, while we would enjoy mostly hail and rain down below. With the high point behind us, we quickly caught up to Sweco yet again and passed them when they ducked off the trail (for sleep we assumed). The trek between CP 20 and 21 was amazing cross-country down a STEEP forested drainage with HUGE sugar pine and sequoia trees. It dropped us in an exposed granite playground of slabs and boulders intertwined with impenetrable manzanita that we picked through for several hours in the punishing hail eventually getting to CP 21 and an "easy" descent to the last TA. Arriving at the final TA we were pretty cooked both from a sleep and food perspective and so spent an ungodly 2 hours in the TA refueling, warming up, and plotting the route for the last ride. We didn't get that section of the race until we arrived at the CP/TA so we had to plan with soupy brains. Finally ready to leave the TA, Sweco arrived now about 2 hours behind us. We knew this wouldn't last as they were sure to have a more motivated transition that couldn't possibly last 2 hours. This last section of the race was more like a rogaine in that the points could be achieved in any order and there were MANY different route options from single track trails to bushwhacking to double track forest roads to some paved sections. After quickly realizing that the shortest route to the CP 24 was not going to be rideable, we backtracked to a longer, but hopefully faster route and ran into Sweco. They'd already cut into our 2-hour lead pretty significantly but luckily for us, they headed for the shortest route that we'd already found inhospitable to biking. At this point, we made a decision to skip CP 24 and come back to it to provide a little separation from Sweco and hopefully avoid providing any extra motivation to them by seeing us frequently. Since CP 24 would essentially be an out and back from our new route that we could hit either before or after Cps 25 and 26, we thought we could snag them without giving away any of our nav decisions. As we approached CP 26 (which we were going to get before 25) we ran into snow and ice. There were only a couple of inches on the ground and they didn't really affect riding, but would leave a pretty obvious trail for Sweco to follow. After we got CP 26, we had to decide if we wanted to get CP 25 by continuing on the road and down a questionable 4WD road/game trail or simply leave our bikes and bushwhack down to the creek. Either way, figured Sweco would know what we did, but if we left the main road and bushwhacked, they might not see where we left the road and so would be on their own for navigation. Mari, one of our teammates, remembered racing in the area years ago and had a vague recollection of the lower 4WD road being a disaster which pretty much sealed the decision. So, we backtracked a bit and found a spot where we could stash the bike and head into the forest without leaving any trace that we'd left the road there. Sweco would ride right by on their way to 26 and find that our tracks ended and have to make their own decision. Our trek to CP 25 was borderline magical, and not because of the sleep deprivation. The moon was almost full and the forest and meadows were blanketed by snow and to avoid being seen by Sweco, we trekked without lights. We quickly grabbed CP 25 after trekking directly to and headed back up to our bikes. When we were about 150 meters from our bikes we heard Sweco coming up the road. We froze in the shadows and watched them ride by on their way up to CP 26, then hopped on our bikes and began the long freezing decent unsure what Sweco would do, but hoping our decision would pay off. The descent was broken up by the expected out and back to CP 24. The rest of the race was a bit of a sleep-deprived blur filled with battling the deja vu of late adventure racing when you are sure you've already ridden the trails and roads and must be doing circles. We didn't know if Sweco might have passed us while we were doing the out and back to CP 24, but could only push on to the finish. After what seemed like an eternity on the road to Lyons reservoir we began the final ascent to the finish. Only when we passed the finish line lookout who told us we were the first team through did we relax a little. Still unsure of the possible time credits, we didn't know where we stood even as we were the first team across the finish line in just under 72 hours. A brief finishing celebration and then off to food and showers. Sweco came in just less than 1 hour behind us, but having missed CP 25, there was no time bonus that could put them ahead of us. We realized we'd won the race and were pretty pumped. So pumped that we slept like rocks for about 2 hours before embarking on the true final stage of an adventure race… gear sorting, cleaning, etc. Overall an incredible race and congrats go out to all the teams for dealing with some pretty intense weather and to an amazing race staff and organization. 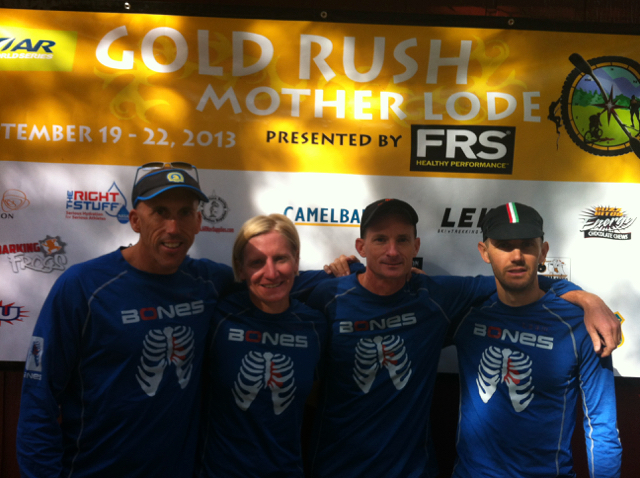 The Gold Rush crew have been putting on races for many years and truly know how to hold an adventure race. Now Team Bones is recovering and prepping for the ARWS championship in Costa Rica. Hopefully, we can put together another smooth race. The first stage (getting all the gear and team organized, packed and to the race start has already begun). Team Bones (USA) racer Jason Quinn gives SleepMonsters an exclusive first-hand report of their race. Jason and team-mates Roy Malone, Chris Barry and Louisa Jenkins took first place in the competition, traveling 450 km from Costa Rica’s southern Pacific coast and making it to the northern Caribbean coast in about 91 hours. The team donated $500 of their prize money to a one-room school that served as a PC for the race. began on the deserted beach. It had to be noon, because the spit of land that we started on is underwater when the tide is in, so for that day either noon or midnight... and like any good race director, Mike has a slightly masochistic bent and there is far more potential for physiologic carnage when you exert yourself during the hottest part of the day in the tropics. When one of our teammates arrived without her bike and box of gear, we were worried that our race might not even begin. But the race organization only puts on races in their free time and runs a wildly successful adventure tourism business with fleets of bikes and kayaks. So after a little wheeling and dealing, we had ourselves the gear we’d need to actually do the race. Granted it wasn’t the carbon fiber goodies we were used to, but the saying holds true in Costa Rica as well... beggars can’t be choosers. After a night in San Jose, we were all spirited away to the coast for the start of the race and our real first night in the jungle. As we sat on the porch of our cabana and went over our gear for the 1043rd time, the jungle just came alive with sounds coming from everywhere. Like some bizarre new age symphony, untold creatures began their nightly ritual of looking for mates, or food. When something that looked like a grasshopper the size of a banana landed on Roy’s bike box, we all looked at each other and decided that no matter what, we were not going to lie down and sleep in the jungle... promises were made to be broken, right? The next day we began the race like all expedition races, as if the race is only 3 hours, and were practically sprinting down the beach for the first 6 km run to our bikes. From there we had a relatively short (35-40 km) ride with some pretty wickedly steep hike a bike, and a few pretty hairy descents. Louisa’s borrowed bike did fairly well considering it was designed and built to withstand a serious beating from unskilled tourists. And after only one major rain-inspired crash, and one broken chain, we arrived at the first TA just as dark was setting in. Having received all the maps before the race began, we knew a little about where we were going, but since we didn’t get any of the coordinates until we reached the TAs, we weren’t sure how big and bad the trek would be. Mike had mentioned in the captains meeting that the trek would be about 100 km, but even plotting all the points in that first TA only gave us a hint at what we were in for. After about 1 hour in the TA spent breaking down our bikes, eating and getting the maps ready, we headed out into the night in 1st place for what we hoped would be a 30-35 hour trek... I said hoped. the “trail” to get through the next 8-9 miles of jungle. The “trail” in question proved to be a slightly less dense swath of jungle that went straight down, then across, then straight up a mountain. It didn’t exactly feel like a trail, or like anyone had likely ever hiked on it. Rather, it felt like someone with an industrial jungle-strength weed whacker drank too much coffee and went running off through the jungle. So after slipping, sliding, scrambling, and crawling all without trying to actually touch the ground lest we accidentally touch one of the giant spiders scurrying around our feet, we finally stumbled out into the village of Angeles (population 18). The owner of the local pulperia (aka mini-mart) opened up shop for us at 4 am and cooked up some chicken-flavored hockey pucks which we scarfed down before heading up higher into the mountains. After Angeles, we were tasked to find the trail to Mount Lira. According to our instructions, it was near a pink house with an electric fence... right. It’s 4 in the morning, you’re in the middle of Costa Rica, you’re stuffed full of chicken pucks looking for a pink house. A little embarrassed, I decided to ask our cook if he knew of a pink house. “Of course,” he said, and pointed up the road. So up we went... and up and up. Hours later when my teammates finally saw the pink house (I’m color blind and couldn’t pick out a pink house to save my soul... and yes, my girlfriend does have to dress me on occasion to keep me from embarrassing myself publicly). Here the trail turned back into the jungle for hours of up and down on what could only be called an actual trail using a definition so broad even Webster would cringe. As we neared the top of Mount Lira I heard a loud crash in the bush to my right. We had seen some big spiders the night before, but if this was a spider, I was quitting the race. When I looked to the right I saw either the biggest all-black house cat who just happened to be lost in the wilds of Costa Rica, or an actual Jaguar sitting in a tree. I called for Chris to confirm the sighting, and protect me should the cat get any wild ideas, but at my shouting and flailing wildly, the Jaguar jumped out of the tree and ran away. Hours later after crossing some sketchy log bridges, we entered the second night of our trek as we climbed up to the continental divide and the highest point of the race. Two of the checkpoints in this section was going to be somewhat difficult. Mike, the race director had said that the coordinates might not be exact, but we should be able to follow the directions given to us and find them without too much difficulty. After spending 3 hours looking for the first one, we were caught by the second place team (Aditec). We told them they were happy to take their time and scour the 2 square km of 3000-meter peak that we’d been searching for the past 3 hours, but go figure, they decided to trust us as we bailed on the CP and began looking for a way out of the mountains and follow us. Well, no sooner had we moved on than we found the CP and began racing again for the 2nd CP on the mountain that would also be difficult... This CP was on the trail... if only we could keep from losing the trail. Four hours later we laid down to sleep until daylight when we figured the trail would be easier to find. Team Aditec joined us in a 4-hour frozen sleep at 10,000 feet in the jungle (note, we had vowed not to sleep in the jungle, but we really had no choice and despite my fear of spiders I crawled under my space blanket for some pseudo-sleep). high point, the rest of the trek was “all downhill” right? uhhh, no. We crossed the continental divide and entered Tapanti National Park, also the wettest area of Costa Rica. After hiking for about 6 hours in some amazingly wet, muddy jungle we caught and passed Team Aditec and got to a point where the trail kind of ended. Re-reading our race instructions, we saw that we were supposed to “find a trail that led down to the river” then travel along the river to a road that would finally lead us to the next CP. Well, the river couldn’t be too far away because we could hear it... or was that the sound of the rain? After some failed attempts at bushwhacking and following trails that ended in impenetrable forest or hillside so steep it made my vertigo return, we backtracked to the last point where we were sure the trail existed to find Aditec there contemplating their maps. Here we had a decision to make. It was pouring down rain, and we still hadn’t lost so much elevation to be where it was much warmer, so with darkness only 2 hours away, we knew that if we were forced to spend the night out there, we were going to need to build some shelter or risk a dangerous night. We decided to try one more direction looking for a way to the river, but also looking for a possible place to hole up for the night. Luckily, we found a passable way to the river and put on a serious hustle to the road. Feeling pretty good, we left Aditec behind and hit the road running. At the next TA, we devoured some food, built our bikes and began the last real stage that would punish our legs. Only about 40 km, the section had 2 pretty big climbs, but lots of flat in between that we figured we could make some good time. And we did until something snagged my tire and tore the sidewall away from the beading. Sitting there with a tire completely destroyed, we thought our race might be over. Maybe it was the sleep deprivation or the high doses of caffeine, but we got wicked creative MacGyver-style and used nylon webbing/ duct tape/ GU wrappers/ patch kit/ and more duct tape to create a working solution in about an hour. An hour later after some pretty hard riding, we got to the town of La Suiza and the next CP. The tire had been holding up really well, but we still had at least 3 more hours of riding and none of us were too excited about trying it on our arts and crafts project. So we began asking locals who were on their way to work at 5 am if we could buy one of their bike tires. Most of them just started pedaling faster and taking a wide path around the smelling, strange-looking gringos. But one guy actually listened to our plight and agreed to sell us his tire. Before we knew it we were on our way. Cruising into the end of the bike ride, we had a quick transition for a short hike, ropes course in the trees, and 3-hour raft down the class III-IV Pacuare River. From there, we had a long... long... long kayak. A quick transition and setting up of our kayaks and we were off on a 100 km paddle. The first 30 km was down the Pacuare River with a few sandbars, but otherwise pretty uneventful. Then the way turned NW and followed a series of canals through the mangrove swamps along the coast. Without the river’s current to help us, the pace slowed considerably, and with night setting in, the sleep monsters came out in force. We sang we yelled, we pinched ourselves, we smacked each other with our paddles, we ate and drank every last caffeinated item we had. But the things that had the most profound effect on keeping us awake were the frogs. Yes, giant albino man-eating frogs... well, they were probably man-eating. Paddling along, minding our own business at 1 am and suddenly these giant white flailing shapes are leaping out of the water 5-6 feet in the air all around us. About the size of a 10 lb Thanksgiving turkey, one would start a chain reaction and then 2, or 4 would just explode out of the water. While their flight paths may have looked random, too many were directed right at my head for me to believe it. For the next few hours, we were so wide awake it hurt... no really, it hurt bad. Finally, after 17 hours in a sit-on-top kayak, we reached Vista al Mar, just outside of Tortuguera and crossed the finish line. First place, first expedition race for half of the team, first-rate race. Overall a truly epic experience. Writing this I’ve realized how jam-packed these last few days has been with amazing experiences and people. Far too many to list them all here. Sitting here on the beach in this little villa drinking a beer and elevating my swollen feet I’m already starting to wonder what marvels I’ll see next year. For anyone looking for a well run, affordable, serious expedition race, in an amazing locale, you’ve gotta check out this race.